NOTE: This topic discusses delegating authority for another user's account. Refer to the help topic titled Direct Delegations if you would like information for delegating authority to your own account. The SO, AA, or AO may delegate Progress Report authority to a PI on behalf of another PI. Select the Admin tab from the Commons menu. Select the Delegations option from the Admin menu. The My Delegates screen opens. If applicable, the My Current Delegations area of the screen displays a table of existing delegations. This table indicates No records found if no delegations exist. 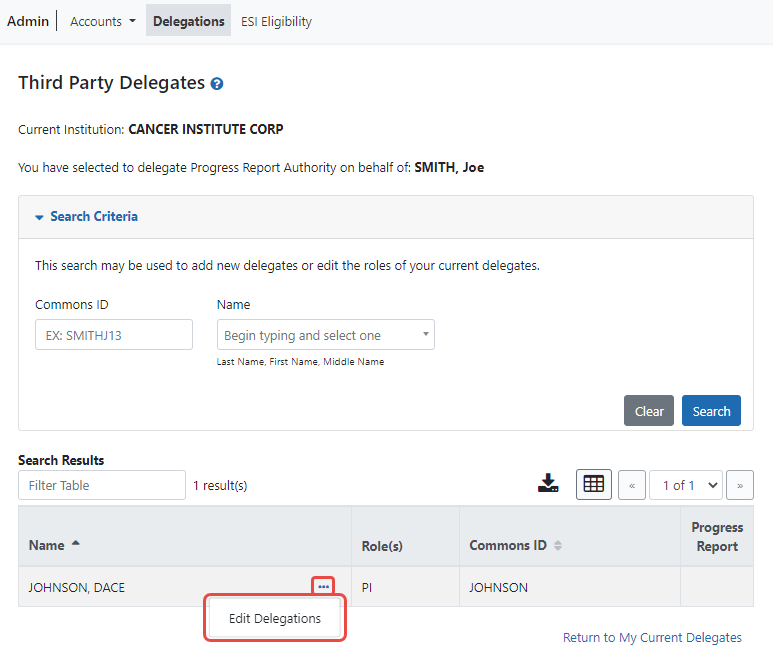 Select the link called Delegate Progress Report. 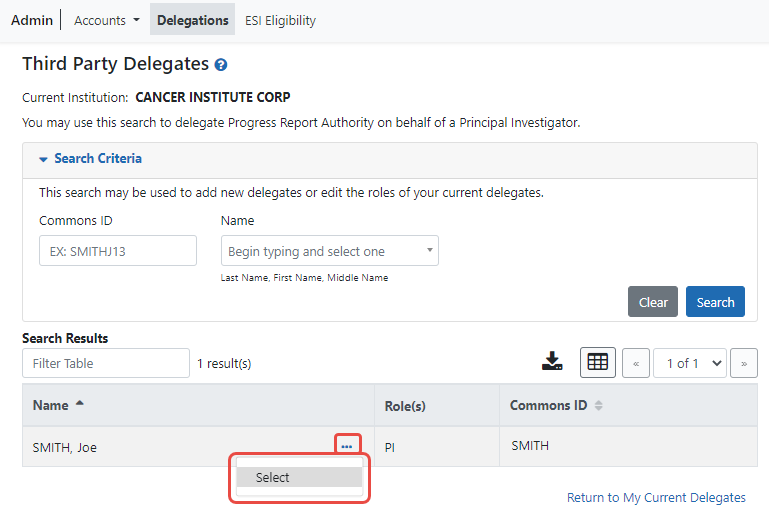 The Delegate Progress Report screen opens with search criteria displayed for locating and selecting a specific Principal Investigator on whose behalf the Progress Report authority is being granted. The parameters include Commons ID, Last Name, First Name, and Middle Name. The screen includes a Search button and Cancel button as well as a Return to My Current Delegates link for leaving the search screen and returning to the previous Commons screen. The search parameter fields can be used with the percent sign (%) wild card. Enter the appropriate search criteria using the wild card (%) if necessary. Select the Search button to perform the search. The matching records display within the Search Results on the page. Choose the Select link to indicate the PI on whose behalf you are designating authority. 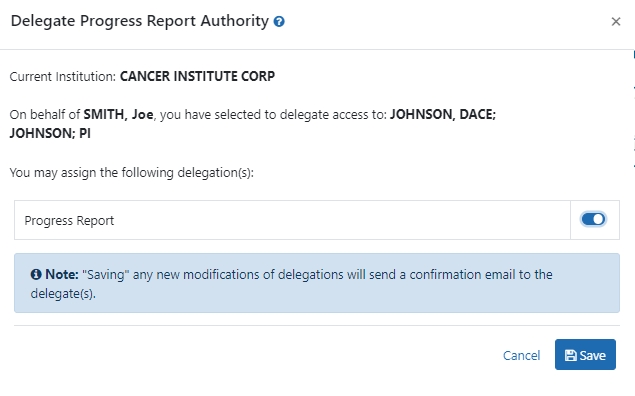 A message displays at the top of the screen as follows: You have selected to delegate Progress Report Authority on behalf of: <Name>. Additionally, search parameters display for searching and selecting the user to whom to delegate the authority. Enter the search parameters necessary for locating the PI to whom you are giving authority and select the Search button. The matching records display in the Search Results table. Click the link called Select to select the appropriate person from the list. 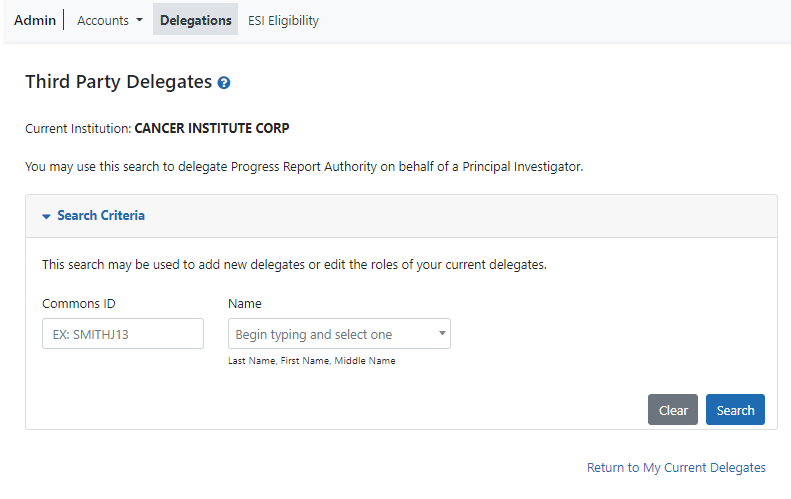 The Delegate Progress Report screen shows the selected PI name with the Progress Report authority and checkbox. Check the Progress Report box. NOTE: Selecting the Cancel button will cancel the action without delegating any authority to the user. The Search Results area updates to show the Progress Report authority marked with a check. Commons grants the Progress Report authority for the delegated user, who receives an email informing of the change. The delegated PI is now able to submit progress reports for the selected PI. The PI, on whose behalf delegation was granted, can see the delegated user by accessing the My Current Delegations information.